Paquita la del Barrio ("Franny from the neighborhood") is the stage name of Francisca Viveros Barradas (born April 2, 1947), a Mexican singer of rancheras and other Mexican styles. She was born in Alto Lucero, Veracruz and started her career in Mexico City in 1970. Her songs usually take a stance against Mexico's sexist male culture. This has made her popular among female audiences. Her signature phrase, with which she often teases male spectators in her shows, is "¿Me estás oyendo, inútil?" ("Are you listening to me, you good-for-nothing?"). 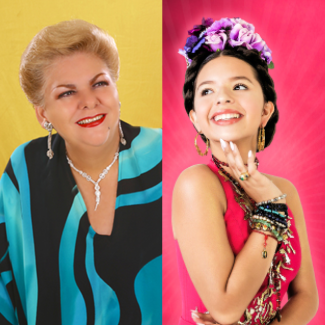 Many of Paquita's albums and songs are jukebox staples in Mexican clubs and cantinas. One of her best known songs is Rata de dos patas (Eng: "Two-legged rat"), in which she uses a rat as a metaphor for a man. Many admirers, particularly outside Mexico, also appreciate her for her camp value. Angela Aguilar was nominated for 2 Latin Grammy's for: "Best new Artist” and "Best Ranchera Album”, She is the youngest to be nominated and perform at the show. "Primero Soy Mexicano" is Angela's new album. The week it was released, it reached the top of the Latin Album Sales Charts on Billboard. Upon its release it placed 4th as the most sold album on Itunes. Meanwhile "La Llorona" (included on this album), was the 3rd most sold digital song in Mexico. The official video of "La Llorona", made it onto the "Artist on the Rise" list, currently surpassing 10 million views on YouTube. Angela has performed on some of the most important stages of Mexico and the United States, being a part of the tour "Jaripeo Sin Frontera”.